As I rolled into Shreveport, La., my first Green Book location was simply noted in the guidebook as the intersection of Pierre and Looney, where the Grand Terrace Restaurant once stood. Remember, as part of #TheRootTrip, I’m not preselecting these locations, so what I find is what I find, and I do my research after checking out what’s either at the site or not at the site. In this case, we have two different possibilities. 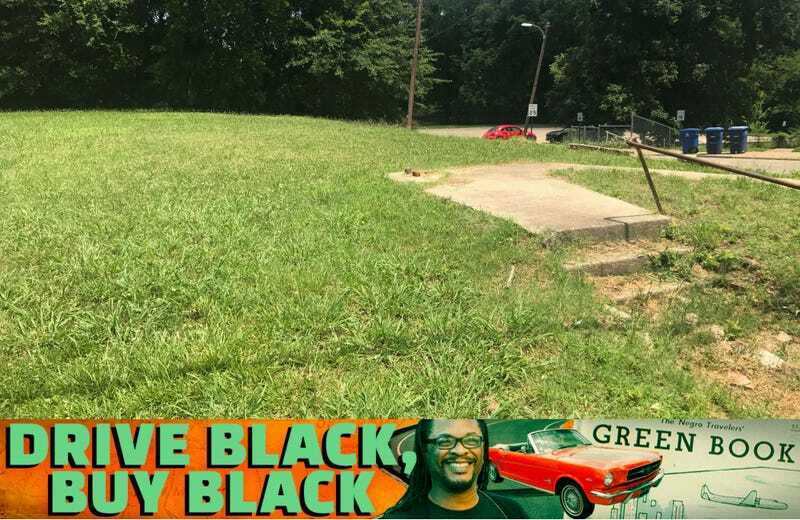 On one side of the Pierre-and-Looney intersection is a vacant lot, with concrete steps from a long-gone building now leading to a grassy field. At first I wondered if it was worth shooting a photo of an empty field, but I quickly realized that an empty field is as valuable a space as an intact building. Did the building burn down? Did it crumble on its own? What are the feelings of people who pass by this field every day? If the Grand Terrace Restaurant was on this location, do they have memories of meals eaten there? On the other side of the street is a building that could have been the restaurant but what is either now, or at least was recently, a car-detailing business. But as I stood across from it, I imagined it as a drive-up diner from the 1950s, where you could meet friends for a cold beer and a fried catfish sandwich. What do you think?